FLIGHT is a multicentre randomised trial of First Line treatment pathways for newly diagnosed Immune Thrombocytopenia: Standard steroid treatment versus combined steroid and mycophenolate. Funded by the National Institute for Health Research (NIHR). Immune Thrombocytopenia (ITP) is an illness that causes bruising and bleeding owing to a low platelet count (blood cells essential for normal clotting). It is an auto-immune disease and relatively rare. It is also non-cancerous and the rare impact on survival has prevented it being a research funding priority. The Chief Investigator is an enthusiastic, dedicated haematologist and ITP clinical lead at University Hospital Bristol. She is determined to improve first line treatment for ITP patients, which has been unchallenged for decades. 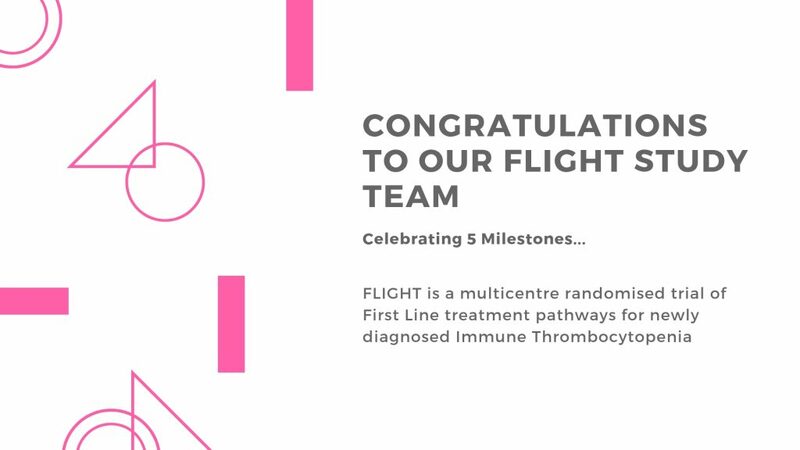 FLIGHT is the first independently-funded UK multicentre clinical trial for IPT and represents a big step forward for research in this disease area. The study came to the Centre for Trials Research from University Hospital Bristol via one of their statisticians, who was involved in a previous study overseen at that time by Cardiff University Haematology Cancer Trials Unit (now amalgamated into the Centre for Trials Research). The official study start date was 1 May 2017, and we submitted the study to the regulatory authorities around the same time. Current first line treatment for patients are high dose steroids and most patients can suffer side effects such as difficulty sleeping, weight gain, mood swings, high blood pressure and diabetes. Unfortunately the illness does not get better for some patients and the majority of others get ill again when the steroids are stopped. About 20% of patients stay well long term. Mycophenolate (MMF) is often used as the next stage (or second line) ITP treatment; it is licensed for this purpose and works well. However it can take up to two months to work during which time patients continue to be a risk of bleeding, bruising, fatigue and usually need more steroids which they dislike intensely. This has a big impact on patients’ quality of life, as they are required to attend hospital frequently for blood tests and most take time off sick. The trial objective is to find out whether more patients would feel better sooner if everyone takes MMF at diagnosis instead of what currently happens (and what MMF is licensed for) – waiting for the illness to return. We are therefore comparing the current way patients are treated (with steroids) to a new way with all patients given MMF right at the start of treatment. In a nutshell – we have had to work around delays in site set up and recruitment! Although the study open date on 27 October 2017 was 6 weeks later than planned as the FLIGHT Data Manager was not in post until 9 October 2017. Despite NIHR research set-up and delivery timelines and our best efforts in jollying site along and maintaining contact with offers of assistance, we have experienced delays owing to lack of pharmacy capacity, local R&D and lack of administrator support within the clinical teams. We needed a large number of sites; essentially recruiting small patient numbers. Thirty sites were approved in the initial application. A further eighteen sites were added in subsequent substantial amendments. We have 2 remaining sites to open; both were approved in the initial application. One of these sites received signed Site Agreement and R&D Capability and Capacity, but then informed us they concluded the recruitment window was too tight and could not proceed with the trial after all! Conversely we have small NHS centres added in substantial amendments opening within 2-3 months. Without recruiting the target cohort, there is no trial and for most studies this is the biggest challenge. We have had a combination of 25 trial committee meetings to date and have spent a large portion of the time discussing recruitment, as well as analysing recruitment graphs, screening and recruitment spreadsheets! Owing to the small patient numbers seen annually in NHS centres, we are continually in contact with our sites for one reason or another, together with periodic updates from the CI – just to remind them to keep a look out for that next patient. In spite of logistical challenges, we have recruited 92 patients to date with actual recruitment exceeding expected recruitment in February and July 2018. As ITP is an auto-immune disease, it can be triggered by abundance of viruses in the general population and clinicians generally expect a pattern of peak referrals in January and September/October. The recruitment target is 120 patients. The original recruitment deadline was 1st September 2018. With some clever statistical calculations, this has been extended to 1st February 2019. Two patients completed 12 month follow up.